Armadillo Review. Armadillo is perhaps the most filmic documentary of recent memory; it’s hard to believe these young men and their families aren’t being portrayed by actors, and you occasionally need to remind yourself that unlike a movie the bullets fired herein can actually kill. Forward Operating Base ‘Armadillo’, located in the Helmand province of Afghanistan, is home to 170 Danish and British soldiers. Nominated for an Academy Award for Best Documentary and winner of the International Critic’s Week Award at Cannes, Armadillo tells of a handful of Danish soldiers serving a six month tour of duty at the facility. It’s an unflinching look at the realities of modern warfare, set on a stage whereby moments of startling brutality comingle with acts of unexpected humanity, where a regiment serves as a surrogate family and where, in a very real sense, death lurks around every corner. 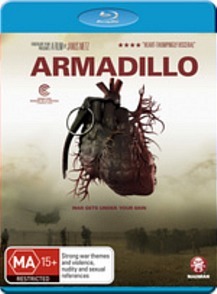 Armadillo is perhaps the most filmic documentary of recent memory; it’s hard to believe these young men and their families aren’t being portrayed by actors, and you occasionally need to remind yourself that unlike a movie the bullets fired herein can actually kill. The end result of the various techniques employed by director Janus Metz – filtered lenses, multiple camera angles, snappy editing, jump cuts, a pulsating metal soundtrack interspersed with moments of telling silence or sombre orchestral interludes– is a mind-numbingly potent exploration of the mythology and psychology of warfare, its economic and political subtexts and, most of all, an homage to the courageous young soldiers putting their lives on the line in the most unforgiving of conditions. Six Deleted Scenes, several trailers and a six-minute interview with Director Janus Metz.